Friday’s Business Live radio presenter had a voice an octave lower than mine. I’ve not been banned from the airwaves for swearing or shock-jockery. A fever and virus has proven hard to shake off, and my voice is a deep croak. But as usual the guests are the stars of the show, and once again they shone. construction plant hire boss Tom Hamilton, whose business has been trading for 128 years, and who is supporting the Bangers and Cash initiative in aid of Roundabout, Sheffield’s Youth Homelessness charity. 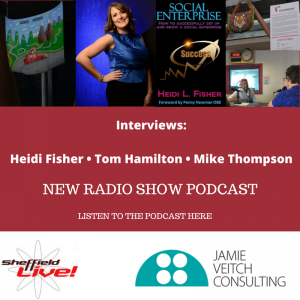 Heidi Fisher, social enterprise and social impact specialist. She’s helped The Wildflower Home in Thailand to diversify and grow their income. And she has impact measurement and growth advice for social entrepreneurs. Mike Thompson on the RiteTrax on the Bole Hills Festival. Tom runs Stuart Hamilton Plant and is taking part in Bangers and Cash in aid of Roundabout. Participants buy a car for £650 or less and will all drive to Monaco. Each car has had its bonnet removed to be hand-painted with an individual design by a Sheffield artist. The bonnets are currently on display in Sheffield’s Winter Gardens. 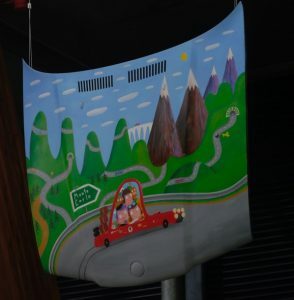 Artists involved include illustrator Lisa Maltby, a previous guest on this radio show, James Croft, who designed the bonnet for Tom’s car, Kate Morgan, Laura Lou Makes, and Matt Cockayne, who came up with the Bangers and Mash concept. In the UK’s “first art road show banger rally” the cars (replete with their splendid bonnets) and their teams will head to Monte Carlo in September (teams are paying their own costs). 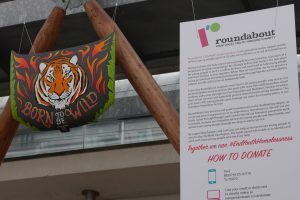 The bonnets featuring unique artwork will be auctioned to raise as much money as possible for Roundabout. Social enterprise expert and author Heidi Fisher recently spent a month in Thailand helping the Wildflower Home, a lifeline to women and children who have survived domestic violence. This social enterprise can’t generate income from its client group. But it does have a diverse range of income streams thanks to a farm, selling eggs, fish, pigs, chickens and more. It sells soap too, plus sewing classes. Heidi told me how, via Venture with Impacts, she’s helped Wildflower Home and why their work is so meaningful to her. I picked Heidi’s brains about impact measurement and growth strategies for social entrepreneurs too. 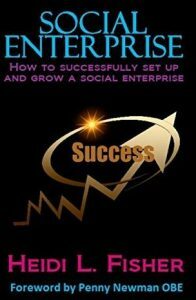 If you want to measure your impact, listen to the interview with Heidi (and get yourself a copy of her excellent book covering every question Heidi has ever been asked about social enterprise). Mike Thompson returned to the studio to tell me about the RiteTrax on the Bole Hills Festival this weekend. And he gave an update about how RiteTrax plays a part in the thriving Castlegate area of Sheffield City Centre.